Outgoing Indiana Governor Mike Pence will be sworn in as Vice-President of the United States on January 20th. Pence has been criticized for a variety of reasons recently, but one area that deserves more attention is his environmental racism. In February last year, the drinking water in Greentown, Indiana tested high in lead. Governor Pence responded immediately to aid the community, and even compared the situation in Greentown to Flint, Michigan's lead crisis. Within two months, the problem had been remedied, and the Greentown residents were back to drinking clean water. Now, let's compare Pence's response to Greentown to his response to another Indiana town, which sits on the shore of Lake Michigan: East Chicago. In June of 2016, the mayor of East Chicago ordered the relocation of the residents of the West Calumet Housing Complex due to lead contamination. The testing of the soil revealed what may be the highest levels ever found in the country. The housing complex had been built on the site of a defunct lead smelter and close to other lead smelting operations. It was eventually revealed that the problem had been known to both city officials and the EPA for decades, yet residents were not warned and nothing was done to protect them or their children. 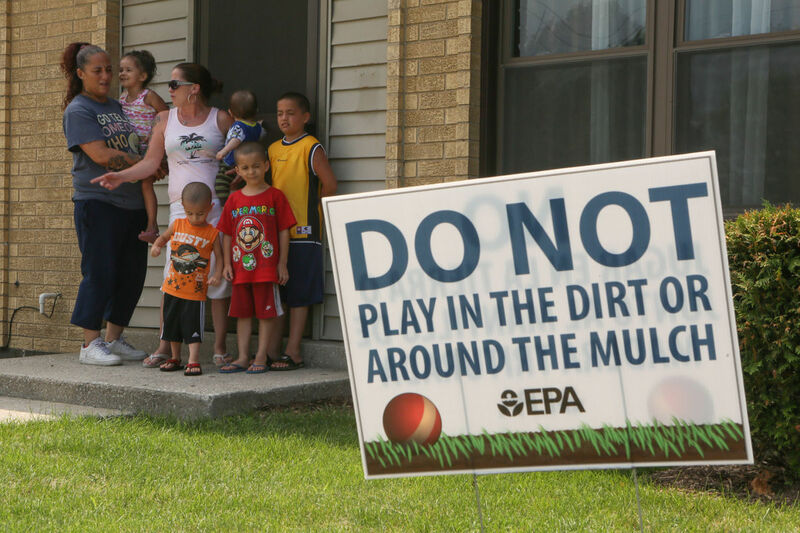 Recently, it was discovered that East Chicago's drinking water is also contaminated with lead. Testing of the blood of the children in the area revealed lead levels as high as 33 micrograms per deciliter. Five micrograms is considered "acceptable". (There is no safe level of lead in the body, even low levels of lead in blood have been shown to affect I.Q.) Over 20% of the children under age 7 were shown to have elevated lead levels (over 5 micrograms), compared to 2% nationally. In spite of the scale and urgency of the situation, Governor/soon-to-be-Vice-President Pence has not acted to help the citizens of East Chicago like he did the citizens of Greentown. Governor Pence did not come to East Chicago, Indiana, like he did to Greentown. And he has had nothing to say the people of East Chicago about their plight, like he did for the citizens of Greentown. Now, why would this be? Why would Governor Pence act so quickly and decisively and effectively in response to a relatively low-level lead contamination in Greentown, but remain so conspicuously silent in response to the historic crisis in East Chicago? The answer is to be found in the demographics of the two communities. Greentown's population of 2,400 is 97% white. In contrast, the over 28,000 residents of East Chicago, Indiana are 43% African American and 51% Hispanic or Latino. "This is too frequent, these hazardous contaminations occurring within black, brown, and vulnerable communities, it is a systemic pattern I see across the nation. This challenge must be addressed at the root of the socio-economic and political underpinnings of these types of systemic inequities that disproportionately impact communities of color and low income communities." Like Flint, Michigan, the city of East Chicago, Indiana is a perfect example of environmental racism. Racism, in the form of "white flight", redlining by banks, and discriminatory housing laws, explains the depressed economic conditions which now prevail in East Chicago and other lakefront Indiana communities like Gary. Racism explains why communities of color like East Chicago and Flint are forced to bear the brunt of the environmental damage caused by dirty industries, which the rest of us benefit from without paying the real cost. Racism explains the failure of the EPA and the Indiana Department of Environmental Management to act in any meaningful way to protect the citizens of East Chicago for decades. Racism explains the lack of public outrage when we learn that people of color and their children are being poisoned by lead and arsenic and that those charged with protecting them did nothing. ... And racism explains the silence and inaction of our soon-to-be Vice President, Mike Pence. This is the new face of racism--new in the sense that whites are beginning to acknowledge it, though it has been going on a very long time. This face of racism does not wear a white hat or shout the N-word. This "new" racism is covert and systemic. It wears the face of benevolent superiority and operates behind the closed doors of boardrooms and congressional chambers--but it is no less deadly. Though the form it has assumed may be unfamiliar to some, it is the same racism. Though it may seem innocuous to those not directly affected by it, it is insidious for those that are. And it has decimated generations of our black and brown brothers and sisters and their innocent children. The fight against environmental racism and other forms of systemic racism can begin by calling our elected leaders to account. And we should start with Vice President-elect Pence.